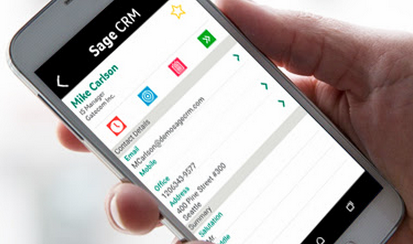 Sage CRM for Android has arrived! Accessing key customer relationship data on the road has never been easier. Learn more about the new features and how to download the App today. Sage CRM for Android has arrived and this mobility has the potential to transform how your sales and customer service teams interact with customers and prospects. Whether in the cloud, or on premise, its quick to deploy and can be easily adapted to fit a company's unique business needs and processes. Customization capabilities, with the ability to display custom fields for people and opportunities on the app. Add appointments and tasks to your phone and push them up to Sage CRM when you are back online. Access your vital customer information even when out of coverage. Import your phone contacts as a Lead or Person into Sage CRM. Add new meetings and tasks and map appointments. Track and log outbound calls, email and SMS activities. Read-only access to history / favorites (Opportunities and Communications). Add notes to Contacts and Opportunities. If you are a Sage CRM Essentials or Professional customer, there are no additional steps required. If you are a Sage CRM On-Premise customer, your Sage CRM administrator will need to install a component, available free of charge from Sage's marketplace to enable the app to work, and you must be using Sage CRM 7.3 or later. It will automatically work for Sage CRM Essentials or Professional customers. Your phone must be running Android v4.4 or later. If you're interested in learning more about how other small to medium sized businesses have utilized CRM systems to revamp their sales approach, subscribe to our email series. You can find more information about it here. For more information on Sage CRM and how it can help your organization, please contact us.